Chocolate and peppermint are the quintessential holiday pair. This flavor duo is featured in hot chocolate, cakes, candies and cookies. These homemade sables highlight this couple's inherent ability to make the other taste that much better. Step 1: Mix flour, sugar, cocoa powder, baking soda, vanilla seeds, and salt on low speed in a mixer. Add butter a little at a time, until the mixture looks sandy. Once all the butter has been added, add the egg yolk and continue to mix until ingredients are evenly distributed. It should come together, but not completely. Step 2: Place plastic wrap onto a work surface for the dough mixture. Form dough into three logs, about 1 1/2-inch wide and 10-inches long. Wrap each log in plastic wrap and refrigerate until completely chilled (at least 20 minutes). Step 3: Preheat oven to 350°F. Unwrap logs and cut slices a little less than 1/4-inch (you can expect 4 cookies/inch). Place on a cookie sheet lined with a silicone liner or parchment paper. Bake for 9 minutes. Remove cookies from oven and let cool. Step 4: Frost cooled cookies with thickened ganache frosting and top with decorations. Let ganache harden. Step 1: Heat heavy whipping cream in a small saucepan until bubbly. Remove from heat and pour over chocolate. Stir until chocolate is melted and mixture is uniform. Step 2: Let cool, stirring periodically until thickened and spreadable. (Don't refrigerate or it may seize). Step 3: If you choose white chocolate, the ganache may appear on the thin side at first, but will harden with time. Alternatively, you can start off with 1/4 cup cream, adding more after the initial combination. Tips: Add a couple drops of peppermint extract to the ganache to increase the minty-ness if you are using crushed candy canes for decorations. For a speedier ganache place 4 Ghirardelli 60% Cacao Bittersweet Chocolate Chips on top of each cookie when they come out of the oven. Put back into oven for 1 minute, then remove. 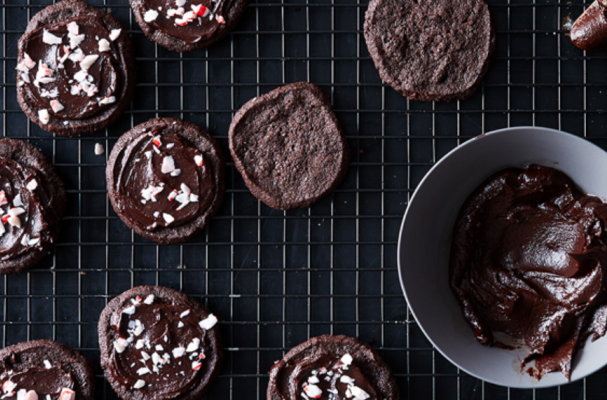 Using the back of a spoon, spread melted chocolate over each cookie, then sprinkle with peppermint shards. Remove to wire rack and let cool.